This chapter was lasted updated by the authors on March 4, 2019. The famous paleontologist George Gaylord Simpson defined systematics as the "scientific study of the kinds and diversity of organisms and of any and all relationships among them" (1961, p. 7). In more general terms, systematics can be thought of as the study of biodiversity. This field of systematics has two major components: taxonomy and phylogenetics. Taxonomy is the field of biology and paleontology that concerns the naming of living (extant) and ancient (extinct) plants, animals, and other organisms. This process is governed by a universal system of rules and conventions derived from the approach pioneered by Carl Linnaeus in the 18th century. The subject of taxonomy--which underpins our ability to communicate about biological diversity--is explored in Section 1 of this chapter. Phylogenetics is the study of the evolutionary relationships among organisms. These relationships are typically depicted by tree-like diagrams. Section 2 of this chapter focuses on several topics related to phylogenetics, including an overview of how to read phylogenetic trees (Section 2.1), how to build phylogenetic trees (Section 2.2), and how to understand the evolution of the characteristics of organisms using phylogenetic trees (Section 2.3). Systematics is the study of biodiversity. Systematists name and describe organisms (taxonomy) and determine their relationships (phylogenetics). 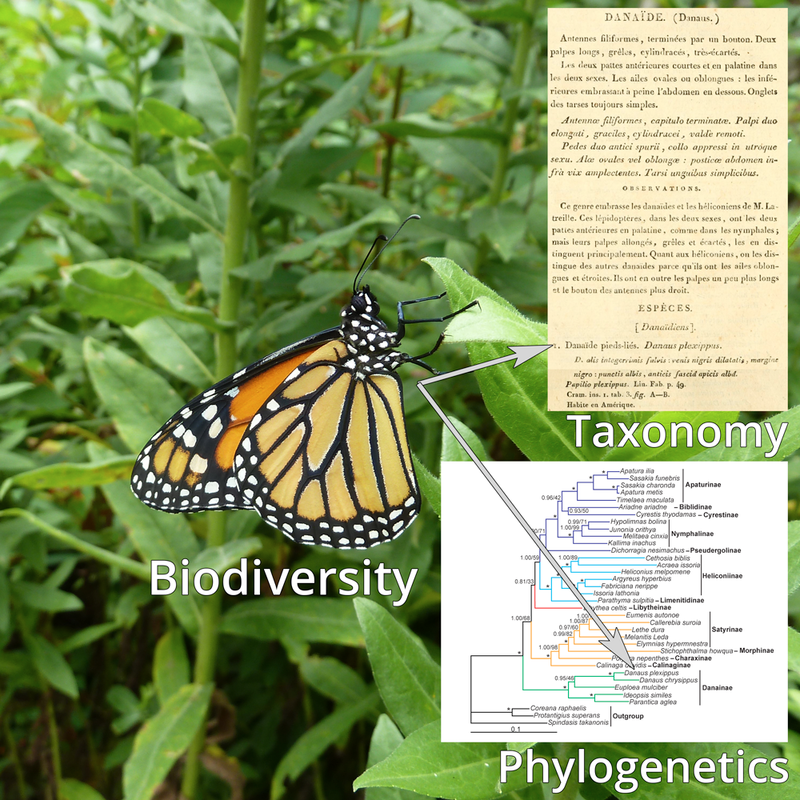 Image shows a Monarch butterfly (Danaus plexippus Linnaeus, 1758), as well as an early description of the species by Lamarck (1835) (top inset) and a modern phylogenetic hypothesis (lower inset) for the species (image modified from fig. 4a in Shi et al., 2015 in PLoS ONE; image license: Creative Commons Attribution 4.0 International (CC BY 4.0)). The connection--and sometimes source of conflict--between taxonomy and phylogenetics is classification. Scientific classification schemes that organize and convey information about biological diversity predate the discovery of evolution. Naturalists long ago found it useful to have a convenient way to communicate about the diversity of life on Earth, at both narrow scales (such as individual species) and broader scales (major groups like flowering plants, snails, or chipmunks). Classifications were initially developed to reflect the apparent order that is observed in nature, which was presumed to be the result of the Divine Plan of a Creator. Later, it was determined that this order is a result of biological evolution, and that hierarchical groupings of organisms possess similar features because of shared common ancestry. Paradoxically, information about phylogenetic relationships can sometimes complicate seemingly self-evident classification schemes. For example, we commonly refer to birds and dinosaurs as though they are distinct groups of organisms, although birds descended from one group of dinosaurs called theropods. Because of this, should we instead call birds theropods? Section 2.4 considers the relationships between phylogenetic trees and classifications. Systematics is the study of biodiversity. Phylogenetics is the study of the evolutionary relationships between organisms. What is the field of biology called that concerns the naming of organisms? Shi, Q.-H., X.-Y. Sun, Y.-L. Wang, J.-S. Hao, Q. Yang. 2015. Morphological characters are compatible with mitogenomic data in resolving the phylogeny of nymphalid butterflies (Lepidoptera: Papilionoidea: Nymphalidae). PLoS ONE 10(4): e0124349. https://doi.org/10.1371/journal.pone.0124349.